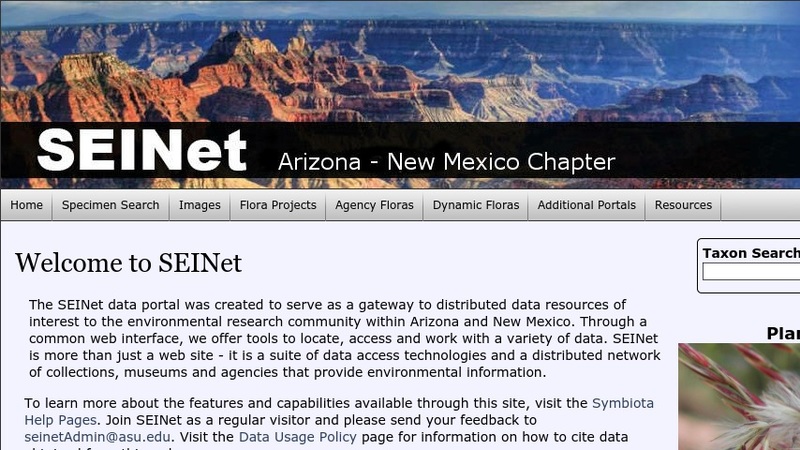 The Southwest Environmental Information Network (SEINet) is a series of linked databases and accompanying web software helpful in using those databases, which will be of interest to the environmental research community in Arizona, the Southwest, and elsewhere. SEINet allows users to locate, access, and work with a variety of data, including biological collections, ecological research data, GIS data, taxonomic information, bibliographies, and research protocols. Searchable databases include herbaria; pollen, fruit and seed collections; and mammal, bird, reptile, and amphibian collections. There is also a library of plant and lichen images; links to identification keys and species checklists from various research projects; information on NaviKey (a Java applet and application for accessing descriptive data); and Symbiota web tools (which integrate biological community knowledge and data in order to help identify plants).